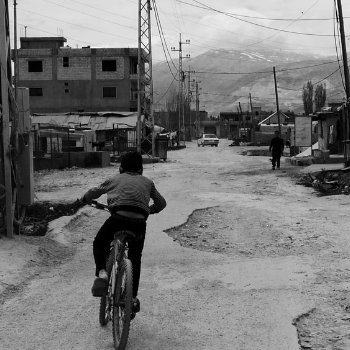 A new interactive website by Wilfrid Laurier University researchers uses drawings, maps, photos and text to go deep into the heart of the experiences of Syrian refugees in Lebanon. The innovative website, Out of Place: Stories From Syrian Families, by Faculty of Social Work Associate Professor Bree Akesson and her research team, is one of the products of a year’s worth of field research with 44 Syrian families living in Lebanon, a geographically small country where a quarter of the population consists of refugees. The storytelling approach of the site stems from the desires of the families to share their experiences with the world, says Akesson. While Akesson didn’t end up using real names or faces, she took to heart the message that her research couldn’t be confined to academic journal articles. “For me it’s really important that when you’re reading these stories, you can really identify with the families and put yourself in their shoes because that’s how we can create empathy,” says Akesson. Akesson and her team interviewed the 44 families, consisting of 351 people including extended family members, between early 2016 and early 2017. The interviewers were mostly American University of Beirut students, who were trained in interview techniques and the study’s research methods. The interviewers went to refugee families’ homes in three areas of Lebanon – the north, the Bekaa (Beqaa) Valley, and the city of Beirut. Many families lived in tents while some lived in cramped apartments or houses. One family had spent some time living under a building staircase. The interviewers invited all family members to tell them about the lives they left behind in Syria, how they fled, and their current day-to-day lives. To add to the stories and encourage input from those less likely to speak up, the interviewers asked children to draw pictures of their past, present and dreams for their futures. Children led the researchers on neighbourhood walks, which were tracked by a GPS-based activity logger. These walks, rendered on the website as maps with photos, show how small the children’s worlds are. A dusty lot is their playground. A nearby store is a highlight. In one case, a nearby amusement park is a place they can only look into from outside. The researchers also asked family members to carry the activity loggers around with them for a week and keep a diary of what they did. The resulting maps also show constraint. Some family members travel to work or school. Many, however, particularly those who don’t have residency papers, barely leave their homes. Partly it’s because going places requires money. Partly it’s because going out risks harassment from Lebanese officials and ordinary citizens. Despite the difficult circumstances, however, Akesson says refugee families are persevering and making efforts to improve their lives and the lives of people in their communities. “We need to understand not only the weaknesses and challenges but also the strengths,” says Akesson. Since the interviews, Akesson has learned a few of the families have been resettled in third countries. Though it’s hard to keep in touch with refugees living in marginal conditions, she believes a few of the others may have returned to Syria, as the Lebanese government is trying to send them back despite the ongoing conflict. Most, however, are likely still in Lebanon, trying to get by as best they can. The stories documented on the website, therefore, are still of great relevance to a broad audience ranging from policy makers to young people. For those who want to help refugees, learning about the issues is an important start, says Akesson. While the website launched on July 24, it will continue to be improved as more stories are added. Eventually, Akesson hopes to translate the site into Arabic, both so the families interviewed can see it and to expand its audience globally. She is also investigating the idea of turning the site into a graphic print publication. Akesson’s research, including the website, was funded by the Social Sciences and Humanities Research Council of Canada, with contributions from Laurier’s Research Support Fund. All members of the project research team contributed to the website, with Laurier PhD student Kearney Coupland and research assistant Dena Badawi playing major roles. Ila Schoop Rutten led the site design and drew some of the black-and-white pictures. Bree Akesson’s mother, artist Patti Akesson, also contributed original artwork.